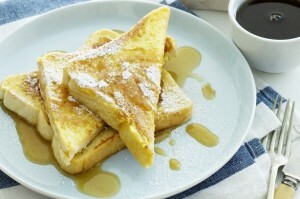 Serve each person with two pieces of French toast, drizzled with maple syrup and dusted with icing sugar. Whisk eggs and milk in a bowl. Heat a non-stick frying pan on medium. Dip a slice of bread into egg mixture to coat both sides. Cook for 1-2 mins each side, until golden. Repeat with remaining bread and egg mixture.